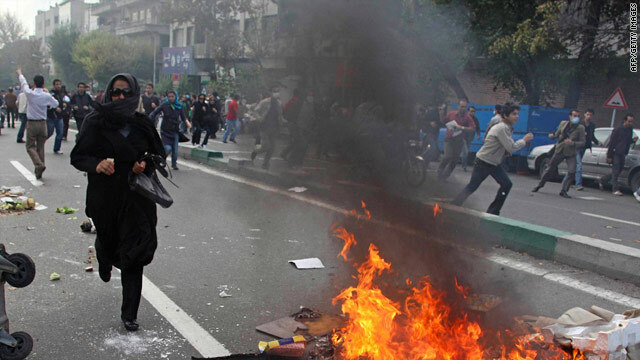 Demonstrators run from riot police Wednesday in Tehran, Iran. More than 100 were arrested. (CNN) -- A Danish journalism student has been arrested in Iran, the Danish Foreign Ministry told CNN on Saturday. "Iranian authorities informed us this morning via our embassy that the young student Niels Kroghsgaard has been arrested in Tehran," Charlotte Slente, head of the department for consular services within the Danish Foreign Ministry, told CNN. "We don't know the circumstances yet, but we are working hard to get more information" she said. Danish authorities don't know where Kroghsgaard is being held nor the charges he is facing. Tehran's prosecutor general, Abbas Ja'afar Dolatabadi, told the Islamic Republic News Agency on Friday that a Danish citizen had been arrested Wednesday. Dolatabadi told IRNA that the relevant authorities are investigating the purpose of the Danish citizen's visit to Iran. "The required measures will be taken after receiving the documents," he told IRNA. A total of 109 people were reportedly arrested Wednesday, of which 62 will go on trial. Three foreign nationals, one Canadian and two Germans, were among those freed, Dolatabadi told IRNA Friday. Danish media reported Saturday that Kroghsgaard, a journalism student from the University of Southern Denmark, had been arrested while he was at demonstrations marking the 30th anniversary of the storming of the U.S. Embassy in Tehran. Niels Kroghsgaard was in Tehran to prepare a media project for his graduation, according to the International Federation of Journalists. CNN has contacted his university but has yet not received any comment. Kroghsgaard is also a member of the student section of the Danish Union of Journalists. He was arrested on Wednesday, and the Danish Union of Journalists immediately used its international contacts to try to locate him. "Now we have to find out where he is imprisoned, so that we can ensure that he gets the right help and that he will be able to leave Iran as soon as possible," the director of the Danish Union of Journalists, Mogens Blicher Bjerregard, said in a statement on the union's Web site. Along with Kroghsgaard, three Iranian journalists -- Farhad Pouladi, working for Agence France Presse; Behnam Nikzad, freelancing for a news Web site in Tabriz city; and Nafiseh Zare Kohan, a freelancer -- are believed to have been arrested while covering the demonstrations, the IFJ said on its Web site. AFP later confirmed Saturday that its reporter had been released. "I'm at home; I'm OK," Pouladi told acting AFP bureau chief Jay Deshmukh, AFP wrote in a news wire. There was no word, though, about the fate of the other two Iranian journalists. "We are deeply concerned about Kroghsgaard and the three Iranian journalists," said Aidan White, IFJ general secretary. "We call on the authorities to identify their whereabouts and to release them immediately." The Danish Foreign Ministry is seeking more information about the case from Iranian authorities. "We will now seek permission to visit him in prison to provide him with consular services," Slente said. "We are always concerned when a Dane is arrested abroad, but we have a long experience of working with these cases and we expect a close cooperation from the Iranian authorities on this matter."